Grocery shopping is one of those tasks you have to do day in and day out no matter how busy your week may be or how lengthy your to-do list is. While delivery services like Amazon and Vitacost can help fill the gap for nonperishable foods, there's no escaping going to the store for fresh produce and other perishable products. 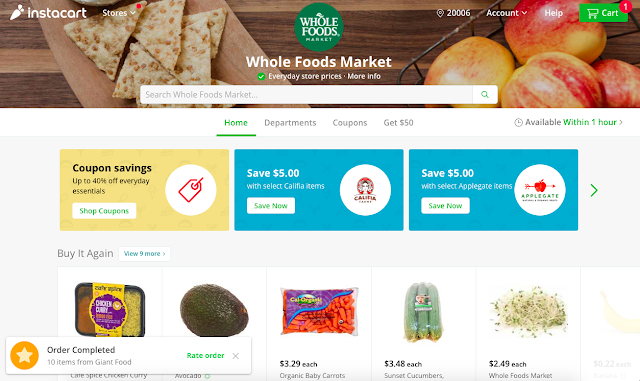 Luckily, Instacart is a great way to simplify the grocery shopping process. In fact, you don't even need to leave the house to use it! Simply shop, set the delivery date, then rest easy knowing that you can cross off one more task of your to-do list. The cool thing about Instacart is that (depending on your area) there are several stores you can choose from to do grocery shopping. In my area, Harris Teeter, Whole Foods Market, Giant and Safeway are all on the platform, as well as many non-grocery stores like Petco and CVS. When you click on a store, you can search its inventory and prepare a shopping list. From eggs and milk to ice cream and prepared foods, it's easy to make a list and specify how much of each item you want to order. For the purposes of my first order, I ordered from Whole Foods Market, and filled my cart with a variety of foods. Once you've set up your cart, you set up your delivery date and time- within a one-hour window. Once that's set, you can sit back and relax, or if you need to change your order, you can do so any time before your shopper is assigned and begins shopping. From the website and app, you can watch in real time as your assigned shopper selects the items on your list, and if items are out of stock, you can advise them how you want them to replace the item- or not. From there, your shopper will deliver your order. 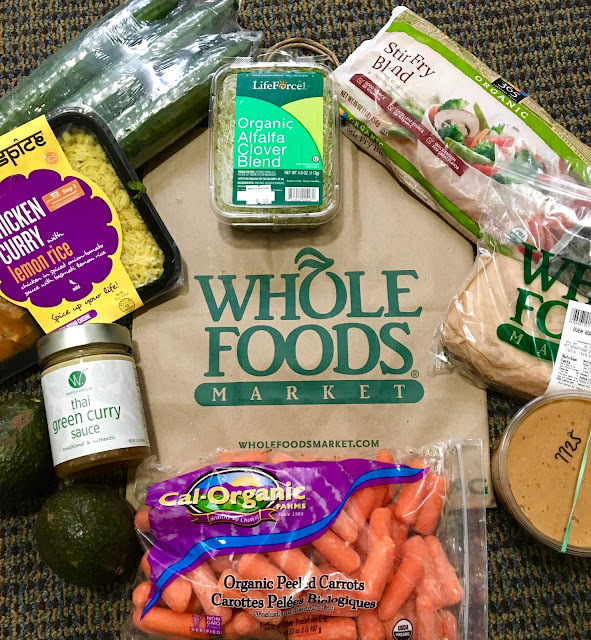 Check out my first order- which included items from across several Whole Foods Market departments. I had no substitutions and the delivery was dropped off right in the middle of the delivery window. I love Instacart, and have signed up for their Express program, which offers unlimited free delivery for a year for $99, plus you won't be uncharged during their "busy" times. For me, it is invaluable because I don't have to battle public transit with a ton of groceries and it saves me valuable time. As a person with dietary restrictions, Instacart is not only a huge help when it comes to running errands, they also are an option to consider when traveling. Instead of eating out all the town when on the road, I can get food delivered for short-term stays, which saves money and ensures I have safe, healthy food on hand. Use code: ACARROLL1C311E to get $10 off your order. Plus- sign up for a new account and get a free delivery with your first order (within 7 days of signing up for the account). Check to see if Instacart is in your neck of the woods and sign up right here. This review is impartial and was not influenced by Instacart. I purchased my order and Instacart Express membership independently and was not compensated for this review.